Dress up your kitchen, pantry, wine cellar, or living room with this charming metal wine rack. Thanks to a winning combination of sleek metal and a classic grapevine design, this wine storage organizer blends both modern and timeless styles, and it is sure to keep your collection of wine bottles safely stored and stylishly displayed. Simply set this freestanding wine rack wherever you need it and fill it with up to 12 wine bottles add both convenient wine storage and sophisticated, modern style to your home. 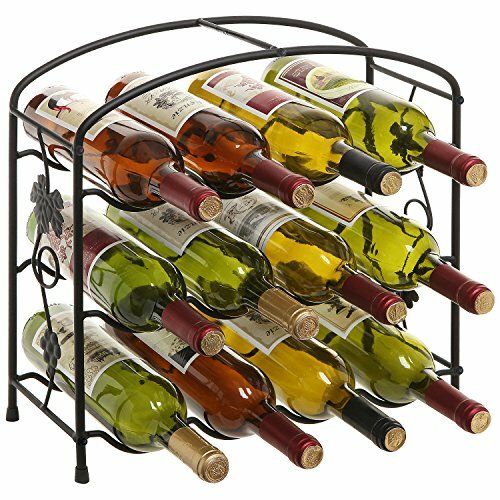 Approximate Dimensions (in inches): 16 H x 16 L x 6 W.
An elegant and convenient wine storage rack made of sturdy metal with a sleek finish and a grapevine design. 3 tiers with spaces for 4 bottles each allow this wine rack to store and organize up to 12 standard size bottles. Bottles are held horizontally to help keep the cork wet and prevent flavor-killing oxidation. **Official MyGift product includes microfiber wine glass spot removal cloth. ** Bottles of wine not included.